Being an artist not a technician I don't know if this idea would work, but since it is in principle quiet simple I'm reasonably hopeful it might, I've made two portable solar ovens which worked though temperatures were not spectacular. A large reflector array like the one pictured using (rarely utilized) roof space could generate heat much higher than that needed by a normal oven, which would hopefully make up for the difficulty of heating such a large oven and getting the heat down the "chimney". 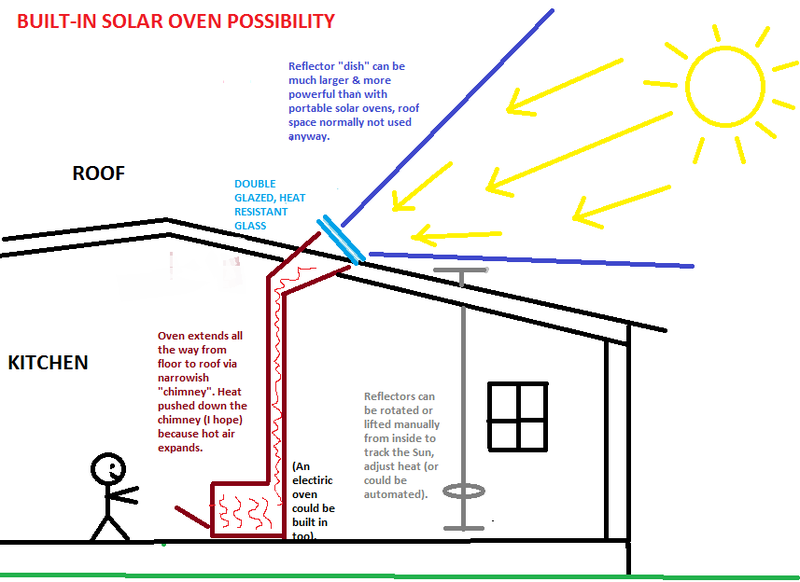 The whole oven including the double glazed glass at the top would be fixed, only the reflectors would need to move to track the Sun. The reflectors needn't be that heavy but an external framework to hold them in place, especially in wind, would probably be necessary. If the air in the oven does not conduct heat sufficiently for the base of oven to reach high temperatures perhaps an (insulated) material with high heat conductivity such as copper could be substituted. Physically moving heated material down (and then back up), by turning a crank say, another possibility perhaps.